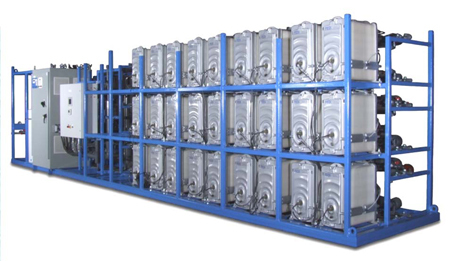 Electrodeionization (EDI) is a membrane process that removes ions from the water to produce ultra pure water. EDI is comprised of ion exchange resin and membranes. The module gets a DC voltage applied across it to help drive the ions into the reject stream. This allows the pure water to exit the module through the product stream. WATERTRAK™'s EDI systems are normally offered as polishing units after single or dual pass Reverse Osmosis units.